FLOWTITE Technology AS represents one of the world’s leading technologies of GRP-pipes – Glassfibre Reinforced Plastic, satisfying the needs of the water and the wastewater pipe market for over 40 years. FLOWTITE Technology AS is part of the Saudi Arabian Amiantit Group with more than 20 manufacturing licensees. With over a quarter century of experience within material development of fluid handling systems, FLOWTITE Technology AS continues to invest in improving the performance and reliability found in FLOWTITE-pipes, thereby maintaining its global leadership position. In order to deliver state of the art technology to the market, a key objective whitin the Amiantit Group, is to direct R&D and plant startups worldwide, and to pool the individual companies’ know-how and equipment resources. These technical resources are mainly based in two Amiantit Technology Centres, one in Norway and one in Saudi Arabia. By concentrating the technology know-how in two powerful centres, the group can achieve synergies by cost effectiveness and concentrating competence and know-how. This way of organising the technology centres also enables the group to employ high-level professionals in order to obtain a leading position world wide in GRP-technology. 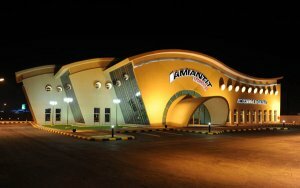 The new AMIANTIT Technology Centre is the result of a close cooperation between AMIANTIT and the King Fahd University of Petroleum and Minerals (KFUPM). The building, with its distinctive architecture, has been established prominently in Saudi Arabia’s Dhahran Techno Valley and the building’s outline will symbolise the innovative work that will be performed there when it is completed. The Centre has also appointed several highly skilled technical engineers. The new staff will join the already existing technology team in Dammam to further strengthen and expand technical competencies. 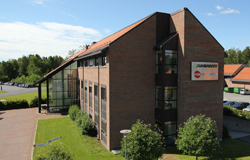 Together with the state-of-the-art testing and research equipment in the new laboratories, the new department aims to be a leading centre of competence in composite and pipe technologies and will work closely and in full cooperation with the FLOWTITE Technology Centre in Sandefjord, Norway. When fully operational, the centre and its organisation will further enhance the group’s Research & Development activities. These extended R & D capabilities will make a major contribution to the further success and sustainability of AMIANTIT and its products, both in existing and new markets worldwide.